Today’s post is a compilation of a couple of recent post. I normally wouldn’t add it, but it was the best sandwich I have had in a while. 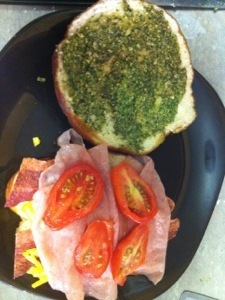 I used one of the pretzel buns I made and added some fresh basil pesto. 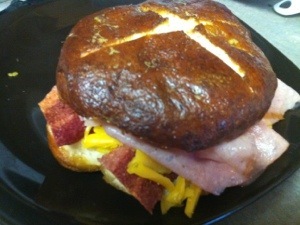 Top it off with some ham, cheese, tomatoes and turkey bacon and I had an awesome lunch!!! !